Striders 5 K. Drove up to Ogden with Ted. Checked out the first mile of the course in the warmup. Paul's profile was correct. Did some strides. Felt good. To see how well I could run a 5 K with my current training - mild mileage, mild sporadic tempos, and overall focus on keeping it hard enough not to lose fitness, but mild enough to let the spinal improvements happen. Measure my max heart rate. Be there to grab good circuit points and prize money in case nobody showed up or I had an exceptional race. Grab one circuit point for participation in case I got pushed down low enough to end up dropping this race from the circuit. Be able to add this race to the predictor. Learn enough about the course to evaluate the performance of other runners and offer them meaningful advice. Have fun racing the competition. The pack was thick going out. Usual contenders. By the mile, Bob, Joe, Corbin, and Leon were in the lead, Paul a bit behind them, then Steve and another runner (need to look up his name) that used to run for Weber State a bit ahead of me. First mile in 5:27, HR at 170. Not bad for the grade. Leon started fading, passed him. 2 K in 7:03. 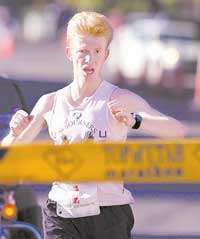 The Weber State runner took it easy on the up, I did not want to take it that easy, passed him. Caught Steve on the down, but then could not stay with him on the immediate up. The Weber State runner passed me. Towards the end of the 0.5 uphill at 6.7% grade near 1.5 I averaged HR of 173 for the quarter, and maxed out at 175. I am thankful for having The Toy to record it. At that point I would not have been able to read it due to fuzzy vision from the effort. 2 miles in 11:18 (5:51). 4 K in 13:54. Finished in 17:05.9 in 7th place. Ahead of me - Corbin won with 16:25, then Bob 16:34, Paul 16:36 (nice breakthrough/comeback), Joe 16:50,Steve 16:53 (good performance, PR equivalent), Weber State graduate 17:00. 5 Fast Running Blogger in the top 10, I am happy about that - Chad finished 10th in 17:55. Three more between 10 and 20 - Ted (ArmyRunner), Scott Browning (NGU Siren), and Cody. Afterwards, Bill Cobler took us for a cooldown on the 10 K course. It is going to be even hillier than the 5 K one. Ran with Benjamin in the afternoon. Good job Sasha. Like you mentioned it is nice to see so many of the bloggers running good times. We also had a race down here today in St. George and many of the guys from the St. George Running Club and the blog turned in good performances. I was also able to talk to some other runners at the race and pointed them toward the fastrunningblog when they were asking for some advice on what I do. I know for me, it has helped a lot, just being able to track my training,and receive feedback from so many good runners. Good race Sasha, You always bring the best out me. Good luck at the 10k. It was great to meet you and see you in action. I am glad you put the race into your predictor. I think you are right on the money with that thing. Look out for that 10K ouch!